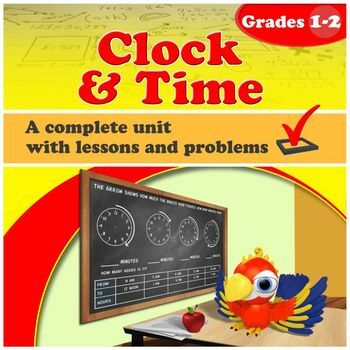 The unit Clock and Time covers reading the clock (whole hours, half hours, and five minute intervals), some basics of time and calendar, and finding simple time intervals. The main goal of the first portion of this unit is to learn the whole and half hours on the clock. Reading the clock is a skill that can and should be practiced in everyday situations from now on so that children can learn by experience and not just by filling in math book pages. It is helpful to have a practice clock, such as an alarm clock, where the child can turn the clock hands. In the first lesson we use an analog clock without the minute hand. The child learns whole and half hours with this special clock, and also practices what time it is one hour or a half-hour later than a given time. The next lesson talks about the minutes. 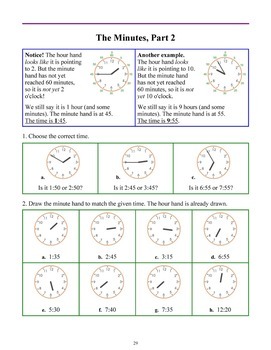 While it does have some clock reading to the nearest five minutes, the main focus in this lesson is to learn that one hour is 60 minutes, a half-hour is 30 minutes, and how the phrases "o'clock" and "half past" relate to the hours and minutes. For example, the child is to learn that half past eight is written 8:30, and that the "30" part means minutes, and that half an hour IS 30 minutes. I have included one lesson about time order. The topics in this lesson are hopefully already familiar to the student. The next lesson deals with morning and afternoon hours: AM and PM. The goal is to understand that at midnight, the clock starts at 12 hours, and goes through all the hours from 1 to 12, and then it is noon, and after that the hours again go from 1 to 12 until it is midnight again. Next, we practice telling time in the hours:minutes form (such as 10:20), and then using the colloquial phrases "ten after," "quarter till," and so on. Also studied are simple time intervals, or how much time passes. 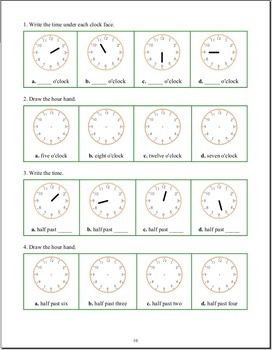 When practicing these, tell the child to imagine moving the minute (or hour) hand on a clock. He/she can initially use a practice clock for this. The unit also contains lessons about the calendar in which the student learns to identify the days of the week and months of the year, as well as specific dates. Of course, the calendar and the months are best learned just in the context of everyday life, as the months pass. Hang a calendar on the wall and instruct your child to look at it every day, and to cross out days as they pass.